For the cookies, place powdered sugar, butter, vanilla and egg in the bowl of a stand mixer. Blend until smooth. Add in flour, baking soda and cream of tartar and mix well. Form the dough into a ball and wrap in plastic. Refrigerate for at least 2 hours. Remove dough from refrigerator and place on a lightly floured surface. Roll into a 1/2-inch thick disk. Use a 3-inch round cookie cutter to cut the dough into circles. Place each circle on a baking sheet and bake for 7 - 9 minutes or until lightly browned. For the frosting, mix all ingredients in the bowl of a stand mixer until smooth. 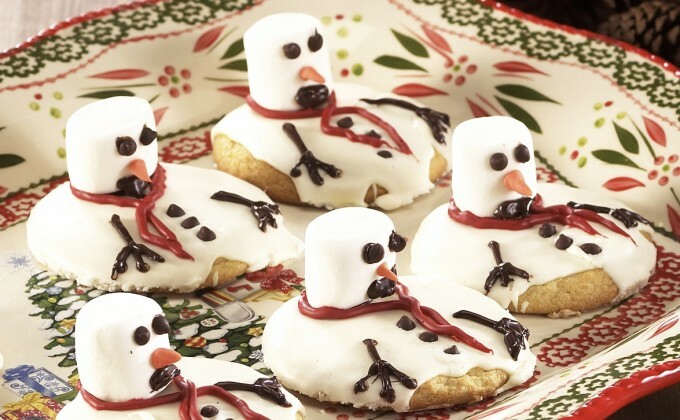 To decorate, spread some frosting on each cookie. This doesn't have to look perfect because it's a melting snowman. Soften marshmallows one at a time in the microwace for 6 seconds. Place on one side of each cookie. Use gel colors to create the scarf, arms, eyes and nose. Place 3 mini M&Ms® down the front for buttons. Arrange on a temp-tations® platter to serve.